Are you tired of living with missing teeth and the discomfort, hassle, and stigma that goes along with them? Do you have an older set of dentures that don’t look good or are uncomfortable? We can help you with either of these problems. At Dr. Gray’s Edmond, OK dental office, we can create attractive, comfortable, natural-looking dentures that fit you well and blend with the shape of your face and your skin tone. The days of fake, blocky looking “false teeth” are over. Lifelike dentures are possible now, thanks to advances in denture and partial technology, and we’d love to help you take advantage of these improvements so that you can smile with confidence and chew in comfort once again. Dentures and partials are not a “one-size-fits-all” product. Dentures should be designed individually so that they look natural with the contours of your features and your coloration. If you look carefully, you’ll notice that nobody’s teeth look exactly alike. Look even closer, and you’ll see that every tooth in a person’s mouth has subtle differences and imperfections. In older dentures, all the teeth look the same. When you seem someone whose teeth look improbably perfect, your brain registers this and recognizes that something that doesn’t look quite right. Modern dentures are designed to capture the subtle imperfections and individuality that makes teeth look real. 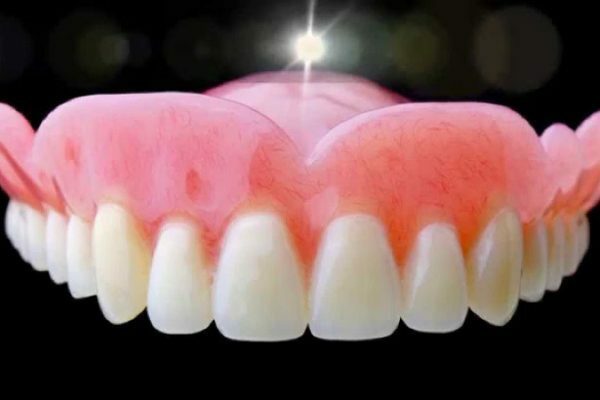 They are created from a material that reflects light in the same way as your own dental enamel, and each tooth is placed into the base individually for a more realistic appearance. Our patients are thrilled with the dentures and partials that Dr. Gray has been able to craft for them, and we’d love to have the chance to help you regain your smile. Is It Hard to Get Dentures? Not at all. Call our Edmond dental office to schedule your consultation with Dr. Gray. During this appointment, Dr. Gray will examine your mouth and take x-rays to gain a good understanding of your specific concerns and challenges. He’ll discuss your needs and your lifestyle and determine the best way to help you. If you and Dr. Gray agree that dentures or partials are the right choice, he’ll take several photos and impressions to send to the lab that custom crafts all of our dentures. You may be fitted with a set of temporaries in the meantime. When your dentures return from the lab, we’ll let you know so that you can return and we can check the fit and appearance. Dr. Gray will then discuss how to properly care for your dentures to make sure that they look good and fit well for a long time. If you ever have any questions or concerns about the appearance or fit of your dentures, don’t hesitate to call us. And, of course, if your dentures become damaged in any way, bring them in so that Dr. Gray can check them and determine whether they can be repaired or if they will need to be replaced. Are you ready to learn more? Call us to schedule your appointment!